Search through your library for one artifact and immediately place it into play; also, choose any artifact in play that you control and place it in its owner's graveyard. If the new artifact has a casting cost greater than that of the discarded one, you must pay the difference or Transmute Artifact fails and both artifacts are discarded. Shuffle your library after playing this card. As an additional cost to play Transmute Artifact, sacrifice an artifact. 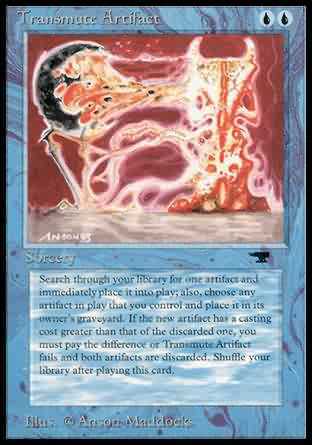 Search your library for an artifact card. If that card's converted mana cost is less than or equal to the sacrificed artifact's converted mana cost, put it into play. If it's greater, you may pay the cost difference. If you do, put it into play. If you don't, put it into its owner's graveyard. Then shuffle your library.